To celebrate this blog getting one million page views, I'll publish my Christmas story a week early. But first of all, I'd like to say thank you to all my readers. THANK YOU!!! This story isn't my best, but it is festive. Inspired by an excellent cartoon by RocketXpert (find him on Deviant Art)... set around Christmas 1983... somewhere in England. Meanwhile, Timothy's mother is having second thoughts about Christmas. In the background, the radio blasts out yet another festive pop song: ...he sees you when you're sleeping, he knows when you're awake, he knows if you've been bad or good so be good for goodness sake... She sighs and wonders if her son really deserves the Christmas gifts he's hoping for. It was the first week of December and naturally most children were getting excited about Christmas. My twelve year old son and I were visiting my friend Kathy who's seven year old son was being a bit of a nuisance. His mother kept asking him to be good, but he wasn't interested; by hook or by crook he'd be the centre of attention on that afternoon. Now I’m not one for disciplining other peoples' children, especially when their parents are present, but I did tell her son that naughty boys don't get any Christmas presents. I glanced at his mother, expecting her to back up my claim but when his mother said, “Oh yes they do!” I was momentarily perplexed. Then she added “But they only get dolls and dresses” and I quickly realised that Kathy's threat was much better than mine. “Did you hear that Timothy?” I said to my own son. Timothy didn't reply, but he did look very sheepish when I told my friend that he'd recently got in trouble at school for not only setting off a fire extinguisher, but also setting off the fire alarm. Kathy giggled and said “I can imagine the look on his face!” When I failed to even raise a smile, she asked if I was really being serious. “He's not that bad is he?” Kathy asked, clearly concerned. We soon moved onto other subjects such as Dallas and Coronation Street and what might be this year's Christmas number one single. “Ooh I haven't heard that one.” I said when Kathy hoped it would be Paul McCartney's new single. “Well... there's not much we can do about the big issues.” Kathy replied. “Apart from get arrested at Greenham.” she nervously chuckled. Our chat focussed on the grimness of the cold war, which thoroughly depressed us both. There's a strange irony that lingers here... the streets and shops are full of festive cheer... yet in reality, there's a dark cloud looming overhead. It shouldn't' be anything to do with us; this stupid cold war... but here we are, stuck in the middle of it all. With our Christmas spirits dampened, we parted company. A week later, I bumped into Kathy by chance on the high street. “Doing some Christmas shopping?” she knowingly asked. “Sure... where do you fancy?” she asked. “Anywhere that's close and warm.” I said. We headed to Ye Olde Café, a new place on Market Street. It's name made us chuckle and we weren't surprised to find it virtually empty. It is after all, a greasy spoon with ideas above its station. A transistor radio blasts out What are we gonna get for 'er indoors? by George Cole and Denis Waterman. “God I'm sick of hearing this song.” Kathy said. “I'm sick of hearing The Flying Pickets!” I replied. Kathy said she likes that song. “So do I but... they just play it too much.” No sooner I’d finished the sentence, one song ended and the next began; ba-da, ba-da, ba-da, ba-da, bada-bada... “See what I mean? !” I said as the familiar intro to their acapella version of Yazoo's Only You crackled out of the tinny little speakers. “So what have you been buying?” I asked as Kathy put a bundle of carrier bags beneath our table. “Oh just bits and bobs for the nieces and nephews.” she replied, before asking what I'd like to drink and going to the counter to order. She returned a few moments later with two coffees, set them on the table and set herself down. “So what have you been buying?” she asked inquisitively. “Well you can say that again.” Kathy replied. “Oh don't put this on me!” Kathy jovially retorted. “This is all your own doing.” she said. “But you are right... the look on his face will be priceless!” she grinned. As is the tradition in my family, Christmas presents are unwrapped after the Christmas dinner and not first thing in the morning. Kathy and I were both a bit tipsy, even as we prepared the traditional meal. We laughed and giggled and joked whilst Timothy sat watching TV, seemingly oblivious to what was awaiting him. “So he's no idea?” she asked as I carved the turkey. “None what-so-ever.” I replied. “Although he's no doubt expecting plenty of train related stuff.” I grinned. “Poor thing.” Kathy said, “Are you going to make him wear it?” she asked. Her tone suggested that she felt he had brought it all on himself. I explained that I'm going to 'encourage' him to wear it. “You mean blackmail.” she said. We were both a bit more than tipsy when the time came for Timothy to open his presents... we were very giddy and couldn't help but giggle as I passed him his first gift. “Sorry about the wrapping paper Timmy... I'd left it 'til the last minute to buy some and that's all they had.” I claimed as he growled at the pink shiny paper. When he unwrapped it find a soft cuddly doll wearing a frilly pink dress, he initially thought he'd been given the wrong gift. When I reminded him that he's been a very naughty boy this year, and told him that naughty boys only get dolls and dresses for Christmas, he burst into tears... and Kathy and I burst out laughing. “Oh never mind, maybe you'll prefer your next gift...” I said. Timothy didn't see the funny side of it, but we certainly did. After unwrapping his dolly, his baby-doll nightie and knicker set, a vintage girl's sailor dress that I'd bought from a stall in the Corn Exchange, plus numerous pairs of knickers, girlie knee socks and some warm woolly tights, Timothy said it was the 'worst Christmas ever'. He was hesitant. Who could blame him? He gulped and nodded. I prompted him to say 'please'. “Yes please.” he mumbled. “You don't think I'm actually going to wear that do you?” he barked. Timothy gulped and in his tiny mind, he tried and failed to unravel her point. “What do you mean?” he whined. “And if I don't you'll tell everyone that all I got was a doll and a dress?” he meekly asked. I nodded, as did Kathy. “Plus a nice pink nightie, lots of lovely pairs of knickers...” she added. The boy stuck out his lip and imagined wearing a dress for the next eight or nine hours. “And then you'll make me wear that.” he spat, pointing at the little pink baby doll nightie set. I turned to Kathy and she smiled. “I think he's finally getting it.” she said. We both turned to Timothy who looked both defeated and mortified. “Would you like us to help you?” she asked him. Timothy gulped and shook his head. His eyes dropped to the numerous pairs of very frilly knickers he'd been gifted. He hesitated. I suggested he wears the pale blue pair, since they match his dress and with a hesitant hand, he slowly reached for them. “With these socks.” Kathy suggested, picking up a navy blue pair of pelerine knee socks with white frilly trim around the tops. “Oh yes!” I exclaimed. Timothy's expression said 'oh no! ', so I asked if he'd rather wear a pair of tights instead. He reluctantly accepted the socks, but couldn't bring himself to take hold of the knickers. “They wont bite you Timmy.” Kathy grinned. “...and once you're wearing them, you won't have to look at them.” she informed him. We both remained silent as he left the room; knickers and socks in one hand, navy blue sailor dress in the other. We listened intently as he climbed the stairs and entered his room, then we looked at each other and a beaming grin swept our faces. “I can't believe he's actually going to wear it!” Kathy exclaimed, under her breath. “Maybe he wants to wear it more than he's letting on?” Kathy suggested. All the while, the Christmas edition of Top of the Pops was on. As the final top 10 of the year was counting down, we stopped thinking about Timothy’s presents and gave our full attention to the TV. “Oh I wanted that to be number one!” Kathy whined just as the door opened. Timothy entered and sheepishly announced his presence. “Shhh it's the chart countdown!” I said, gesturing him to sit. He sat. Between his navy blue knee socks and his navy blue frock, his pale fuzzy knees knocked nervously together. “The Flying Pickets!” Kathy and I said in unison as the camera zoomed in on the acapella sextet. “Let's have a look then!” I said to my son, prompting Timothy to stand. “Ohh.” he grumbled as he stood. “That looks nice. Quite boyish for a dress.” Kathy said. “I like the length.” She was neither gushing nor teasing or sarcastic in her tone. I followed suit. “I like it too. I didn't think a really girlie one would be suitable but... like you say, it is quite boyish really.” I said as my son stood blushing in his new blue sailor dress. “What do you think?” I asked him. “It's nice being able to see your legs for once.” I said. The frilly interface between sock and knee is particularly charming. My eyes followed the pelerine pattern down to his feet. “Oh... I'd almost forgot about these.” I exclaimed, picking up the shoes. Fear purged though him and he begged me not to make him wear them. I expected this sort of reaction when getting him to wear his dress so was somewhat confused that he'd saved it until now. “Because if I wear those, you'll make me go outside.” he claimed. The poor thing was on the verge of tears. I assured him that I was not going to make him go outside and reiterated that so long as he's a good boy and does as he's told, then no one else need know. With great reluctance, he donned the shoes; a simple pair of white Mary Jane’s with a single strap and buckle. “Would you like to unwrap your big present now?” I asked once he had them on. “Sorry Timmy but...” Kathy grinned. “...I couldn't resist.” She aimed the camera at him and prompted him to continue. “Oh Mu-um!” he whined when he'd removed enough paper to reveal his 'big' present. He huffed and puffed and stuck his lip out. He didn't open the box on his lap. Instead he just stared fearfully at the picture on the front. I suggested he could set it up in front of the TV whilst watching Superman The Movie. “Can I just watch the film?” I meekly asked. “It'd be nice to get a photo of you playing with it Timothy.” Kathy teased, wielding her camera. Kathy nodded. “A Christmas present to myself.” she said as she handed it to me. Timothy begged me not to take another photograph of him. “Well... if you don't want to set up your train set, can I at least take one of you holding Florence?” I grinned. “Please don't Mum.” he whined. Save to say, I didn't insist on taking a photo of him with Florence on his knee, but I did insist on him keeping Florence on his lap whilst we watched the Queen's Christmas Message and the following movie. For a while, I suspect, he was so completely engrossed in the movie that he appeared to be totally at ease with his dress and his doll. As the end credits rolled, we turned over to watch the end of Meet Me in St Louis. Kathy and I couldn't help but comment on the old fashioned dresses. “Imagine have to dress like that every day!” she said. I think it was aimed more at me than Timothy but that didn't stop us from both looking at him and watching him squirm. When the musical extravaganza ended, Kathy gathered her things and prepared to leave. Timothy visibly cringed when she said she'd pop round when she's had the photographs developed. No sooner had she left, Timothy asked if he could take his dress off. “It's a bit early to be getting ready for bed.” I said. Given the choice between wearing his blue dress of his pink nightie, he opted to remain in his dress. “Why don't you set your train set up?” I suggested. “I don't want to.” he grumbled. I pestered him into doing it anyway and thoroughly enjoyed watching the troublesome twelve year old boy quietly assembling a train set designed for a six year old girl. Play Your Cards Right began and I picked up the TV and Radio Times. “Oh... Cinderellas on the other side. Would you like to watch that instead?” I asked. “No.” I grumbled. “Can I stay up and watch The Pink Panther?” he asked. “Please.” he added. “But it's Christmas.” he muttered. “It's not more girl stuff is it?” he grumbled. “What's that?” he nervously gulped as he cast a pair of worried eyes over its cover. “I promise I'll be good from now on.” he snivelled. “Oh I'm sure you will be.” I replied before prompting him to open the big present. Predictably, he burst into tears. “But...” he moaned, sticking out his bottom lip. He knew I wasn't going to take no for an answer and just like his dress, wearing a nappy is preferable to everyone knowing that he has them. "Why don't you take them up to your room?" I suggested. "I don't want them in my room!" I moaned. "Well... we could leave them down here, but people might see them and... noticing the age range, they'll know they're your nappies." He picked up the bumper pack of pre-teen nappies and sloped off to his room. He returned a moment later looking very sheepish indeed. Apparently, the pack is too big to fit under his bed or in his wardrobe, so it's in full view beside his bed. "Well, it's the best place to keep them." I said. We watched TV for a bit and at around 8.30pm, I asked him what time his film starts. "Er... nine o'clock." he replied. I suggested he go and get ready for bed now, so he doesn't miss the beginning, and he meekly asked if he had to wear his new nightie. "Of course." I said, "And a nappy." I added. "Do you want me to come and help?" I asked. He stuck out his lip and told me that he doesn't 'need' nappies. I told him that if he'd been better behaved this past twelve months, that he wouldn't have them and since he's got them, he will wear them. "It's entirely up to you if you wear them just for bedtime or all the time." I stated. "And as things stand, you're this far from wearing one all day tomorrow." He hung his head and sloped off to his room. “Oh Mu-um... this is embarrassing enough as it is.” he whined. Regardless of his shame... I made him lift his little nightie and lower the matching pink over knickers to show me his nappy. “Lovely.” I said. It has a picture of a big blue butterfly on the front. The transparent 'aqua-pants' have lacy blue trim around the leg holes and waist. He asked for his gown back. I declined, telling him that it's plenty warm enough and that there's no point wearing such a nice nightie only to hide it beneath his old dressing gown. He huffed and puffed but shut himself up when the film began. “Where's Florence?” I asked. “Ah, here she is.” I said, picking her up and handing her to him. He wasn't at all happy when I made him sit with her on his lap, but seemed to forget all about his dolly, his nappy and his nightie when he soon began laughing along with the Pink Panther movie. I offered to make him a drink; a glass of juice or a mug of Horlicks, but he declined. Maybe his nappy isn't too far from his thoughts after all? Mum made it perfectly clear why she'd made sure this Christmas was the worst ever, but I still couldn't fathom why she'd decided that it was OK to be quite so mean to me, on Christmas Day of all days! I woke up on Boxing Day morning, peeled my eyes open and the first thing I saw was Florence... right next to me in my bed! I knew full well that I'd left it downstairs so my mother must have put it there. I pushed it to the floor, growling. I hid myself under my duvet and reflected on the previous day's events. I was fully aware of the nightie I wore, but it took me a few moments to realise that I'm also wearing a nappy. I recalled the way my mother and Kathy laughed at me as I unwrapped my Christmas gifts whilst tears streamed down my cheeks. I could still barely believe just how awful the most exciting day of the year turned out to be. I poked my head out from beneath my duvet when I heard my bedroom door opening. Mum entered and smiled at me before announcing that it's snowing as she opened the curtains. This filled me with instant excitement and I practically leapt out of bed to look out of the window. For a few seconds I'd forgotten all about my tiny pink nightie, until Mum asked me if it was nice to sleep in. “No!” I grumbled as I ducked away from the window. She asked me if I needed my nappy in the night. “NO!” I yelped, before meekly asking if I really have to wear one every night. “What does it say in your pettiquette book?” she asked. “Err...” I wasn't sure. I'd flicked through it, glanced at the pictures and shied away from reading the text. I glanced at my wardrobe and gulped as I considered the new garment that hangs inside it. “Do I have to wear that dress again today?” I mournfully asked. “You can if you want to.” Mum replied. In no uncertain terms I told her that I didn't want to. Mum said that was fine. “Just make sure you wear a clean pair of knickers.” she said as she lifted Florence from the floor and put her on my bed. “Oh Mu-um... do I have to?” I whined. “Yes you do.” she said. “Now go and wash up before you get dressed.” Of course I huffed and puffed about having to wear another pair of knickers, even under my boy clothes. Mum claimed I’d forget all about them once they're on, but I didn't. Horror flooded through me. I'm not happy about wearing knickers beneath my boys clothes, let alone a nappy that might be wet when we arrive. I begged my mother not to make me wear a nappy for the journey. “Well... I suppose an hour isn't 'that' long.” she conceded, before telling me to go before we leave. I pushed my fists through my jacket sleeves as we prepared to leave. 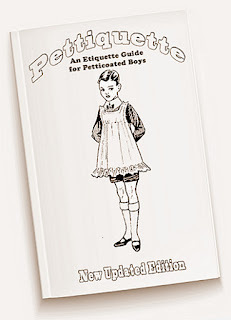 Mum suggested I bring something to read on the way, such as my Pettiquette book. I'd flicked through it several times and really didn't like what I saw. “What's that one?” I asked, referring to Mum's green book. “This?” she said, showing me the cover. “It's the same as yours really, only this one's for parents.” she told me before telling me to fetch my Pettiquette book. I moaned and said I'd rather look out of the window. “It's either your book or Florence.. it's up to you.” she told me. I took the book and followed her to the car. “By rights, petticoated boys should be on the back seat.” Mum said as I opened the passenger door. "But I suppose you'll be OK in the front." she added. I think I'd have preferred to be in the back because being beside her means she can constantly prompt me to read my book and not look at the landscape. 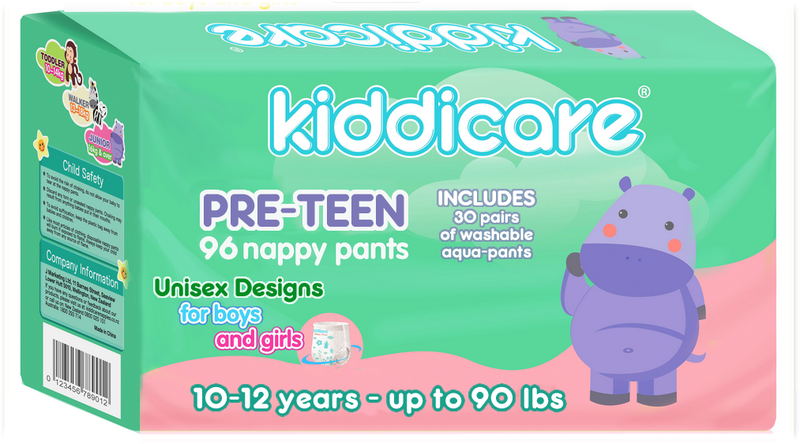 It states that all petticoatees must wear a nappy at bedtime because bed time means 'bed' time. Your nappy alleviates to need to use the bathroom during the night, which can disturb other members of your household. It also discourages one from playing with themselves. If you have to wear your nappy during the day, it's usually a result of naughty behaviour, disobedience or poor personal hygiene. Don't expect to be allowed to change it the moment it's wet or soiled, so always apply plenty of nappy rash cream before donning your nappy, and make sure that you properly cleanse yourself afterwards. Don't expect a grown-up to do this for you. You're not a baby. Mum asks me what it says, so I hesitantly paraphrase. “It doesn't say anything about having to wear one for long journeys.” I mumble. My mother had asked the members of my family to give me gift vouchers rather than buying something. The gift vouchers from my Grandparents, aunts and uncle added up to £25 and since the January sales start on December 27th, I might find the Intercity 125 train set at a knock down price. “Can we go tomorrow?” I eagerly asked. “If you like.” Mum smiled. Mum directs me to a section titled Visiting Friends and Relations. It tells me to be polite, to only speak when spoken to, to say please and thank you, to not touch anything without permission, that pointing is rude, that I should sit up straight, keep my knees and ankles together, no elbows on the table, not to speak with my mouth full... on and on the list went. Eventually we pulled up outside their house but before we got out of the car, Mum told me to open the glove box. “Why?” I asked as I flipped it open. “Because there's some nappies in there.” she said, opening her handbag. “Any messing from you and I'll make sure you wear one...” she informed me as she held her hand out. There must be twelve of them in the glove box. Mum beckons me to hand her one and with a nervous hand I reach inside and pull one out. “Rubber knickers too.” she said. “Thank you.” she chirped as she put them into her handbag and zipped it shut. “No you don't have to.” she replied. “I was only asking. It's here if you want it.” she said, patting her handbag. We said our goodbyes; my uncle shook my hand, my aunt hugged and kissed me and my cousins were too engrossed in watching The Krankies to even register that we were leaving. It's too dark to read on the journey home so I stare into the road ahead and consider my fate. With a huge pack of nappies beside my bed, a healthy stack in the glove box and one in Mum's handbag... how long will it be before they're 'normal'? It wouldn't be so bad if it was just the dress, something to wear on the odd occasion that Mum decides I should. Even my knickers aren't so bad compared to a nappy. Even if I don't use it (and I won't! ), just wearing one is beyond humiliating... just having them is bad enough. The pack is so big it won't even fit under my bed so won't be inviting any friends around for a while. We arrive home soon after 6.00pm. I flicked on the TV and picked up the TV & Radio Times to check the schedule. Paul Daniel's Magic Show had just started. “Can I watch Rocky?” I asked. “No.” Mum replied, citing it going on beyond my bedtime and her wanting to watch a ballet on BBC2 as the reasons. I claimed that Rocky doesn't end late (10.00pm), before enquiring when my bedtime is. Normally it's ten or eleven o'clock if it's not a school night, but in light of recent changes... “What does it say in your Pettiquette book?” she asked. “I dunno.” I said before being prompted to find out. Ten minutes later, I’m whining because the book says that I should be in bed no later than 8.00pm and that I have to have a bath every night. “You'll be smelly if you don't have a bath.” she tells me. “But I don't need one every night.” I whined. “I didn't have one yesterday.” I stated. “But why?” he knowingly whined. I didn't bother pursuing it any further. At least I'll be able to watch Kenny Everett, I figured. I figured wrong because no sooner it had started, Mum had me up in the bathroom where a bath oozing with bubbles waited for me. For the first time since I was about five years old, my mother proceeded to scrub my arms and hands, back and chest before washing my face and hair. Thankfully she left me to do the rest myself. I stepped out and began drying myself as the water gargled down the plughole. “All clean?” Mum chirped as she returned. She'd fetched one of my nappies and made me pull it on in front of her. Printed on the front is a teddy bear holding a love heart. Mum described it as 'cute', I described it as 'horrible'. I pull on the rubber knickers and the teddy bear design is still clearly visible through the milky transparency. Having an inch of frilly lace trim around the legs, my mother grins and tells me how pretty they look. I whine and complain that the elastic is too tight. “It's supposed to be tight... otherwise they'd leak.” Mum told me. I trotted from the bathroom to my bedroom and wasted no time pulling on my cotton baby-doll knickers and nightie. Out of sight, out of mind... almost. My mother watches over me as I climb into bed. I pull my duvet right up to my neck to hide every bit of my horrendous pink nightie. “Now... bedtime means 'bed' time which means you should stay in bed until morning.” she reminded me. “If you flush, I'll hear it, if you don't, I'll see it... so unless you want to wear a nappy all day tomorrow...” She didn't need to say anything else. I stuck out my lip and hung my head. Mum's threat echoed in my skull when I woke in the night needing the toilet. I swallowed my pride and used my nappy before eventually drifting back to sleep. Admitting that I'd wet my nappy the following morning was beyond humiliating... but Mum said I'd been a good boy before putting me under the shower. In my room, she'd placed a pair of knickers and the woolly white tights on my bed. I moaned at the prospect of wearing tights, but Mum said they'll be nice and warm and reminded me that we're going to spend my gift vouchers today. Being 'high street' vouchers, they can be exchanged in most leading stores. Mum suggested I spend them on clothes but I wanted to spend them on my train set... not my new one, but my proper one. We went to the big toy shop and straight to the model railway section. The Intercity 125 had been reduced from £35 to £30 pounds which meant I was £5 short. I asked my Mum if she'd put up the extra money but she refused. “Why not get some things for your new train set?” she suggested. 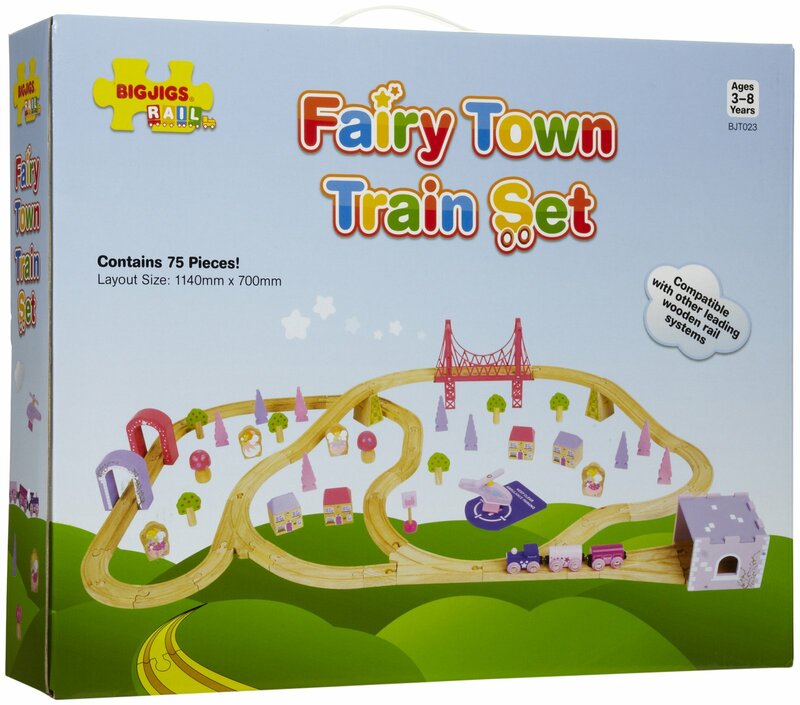 For a kid's train set, there was some cool accessories such as cranes, coal hoppers and an engine shed with a turntable, but Mum restricted my choices to the Fairy Town accessories only. I exited the toy shop with the princess express and the pink 'fairy' tunnel. These items came to £22 and my remaining £3 was spent on two new dresses... for Florence. When we got home, Mum suggested I move my train set up to my bedroom. She also suggested that I put Florence in one of her new dresses, and that I wear my sailor dress for the rest of the day whilst playing with my trains. “Do I have to?” I whined. “What do you think?” Mum asked. I glumly took hold of the carrier bag from the toy shop and turn the leave. “Oh... can you put this in the bathroom cupboard on your way.” she said, passing me the huge tub of nappy rash cream. That evening, I asked if I could watch Hooper which finishes bang on my bedtime. Mum said I could but once again, she put me in the bath at around 7.20pm so I only got to watched the first half, which to be honest, was mostly boring. “It feels all gooey.” I whined as I smeared the cream on myself before washing my hands and pulling on a clean nappy. “Well it'll stop you from getting sore if you wet yourself again.” she said. “So would letting me use the loo.” I sulked as she put Florence in my arms. “Maybe so... but petticoated boys don't use the toilet after bedtime.” she bluntly reminded me. I distinctly remember putting Florence on the floor but woke up to find her beside me. After a quick shower, I got dressed and was prompted to put Florence in one of her dresses. “Why?” I whined. “Because she can't spend all day in just her underwear can she?” Mum replied. “You wouldn't like to wear just your knickers would you?” she asked. I shook my head before meekly proceeding to put Florence in one of her three outfits. She spent much of the day on my lap as I watched TV, (reluctantly) played with my train set and flicked through my pettiquette book. “Mu-um?” I murmured. “Only at first.” she claimed. “It takes a little while to get used to knew things.” she informed me, citing moving to a new town, starting a new school or even having new shoes as comparable examples. Throughout the remainder of the Christmas holiday, my mother prompted me to address her as Mummy instead of Mum. I didn't want to but but after a while I got tired of having to rephrase every question, request or reply in accordance with the guidelines in my pettiquette book. Saying Mummy felt shameful and humiliating for a twelve year old but it was easier than having to correct myself all the time... although contrary to my mother claim, I'm not getting used to saying it. I’m not getting used to my super-early bedtime either, or wearing knickers every day and a nappy every night. Going to sleep feeling gooey and waking up wet is horrible... and that nappy rash cream has made what little hair I had down there disappear. Mum says it's more hygienic. When I returned to school after new year, everyone wanted to know what everyone else had got for Christmas. I couldn't help but visualise my navy blue nautical dress, my numerous pairs of girl's socks and knickers, my Fairy Town train set and my huge pack of nappies as I muttered my well rehearsed reply. “Not much, clothes and stuff for my model railway layout.” Most seemed to think my enthusiasm for model railways was geeky and boring so no one pressed me for any finer details. In the afternoon we had geography and the geography teacher is also the year tutor; a kind of headmistress, but overseeing just one of the five year groups. After geography is the afternoon break, but Mrs Webb asked me to stay behind after the others have gone. As the last one leaves, I defensively tell her that I haven't done anything. “I never said you had Timothy.” she replied, before asking me if I’d have a nice Christmas. “It was OK.” I meekly mumbled. Little does she know that I'm wearing two of my gifts. I gulped and glared at her. My blood rushed into my head. I hoped I'd misheard her but I knew I hadn't. How does she know? I thought. I grimaced and gulped. She asked me if I'd been reading the Pettiquette booklet. “Yes Miss.” I sheepishly replied. “Maybe so... but it's better than wearing one for school.” she replied. "Yes Miss." I muttered as my nightly routine flashed through my mind. No sooner I'm out of the bath, I have to smear a thick layer of nappy rash cream all over my bits and bum before pulling on one of my nappies. They're supposed to be 'unisex' but they all look girlie to me; decorated with butterflies, princesses, unicorns, fairies, teddy bears, bows and hearts. Mum claims that only the princesses, fairies and heart designs are for girls... but how many boys would willingly wear anything with a butterfly, unicorn or teddy bear printed on it? “Have you any questions?” Miss Webb asked. “Yes Miss.” I gulped. It can't be any worse than this one, I thought. “I certainly hope so.” she said, smiling through pursed lips. “Now I want you to know that you're not the only petticoated boy in the school.” she stated. "There are others so you're not alone." “You don't need to know their names, just like they don't need to know yours.” she replied. “I just wanted you to know that you're not the only one.” she added. Maybe she felt that that nugget of information would make me feel better? It didn't. She sent me off to the school yard where a couple of pals approached and asked what I'd done. “Nowt.” I replied. “She was just telling me not to get into trouble this year.” I told them. They snorted and sniggered, telling me I'll be in detention before the week ends. God I hope not. They're easy enough to get even if you don't do anything wrong but the consequences for me are far greater than being kept behind for fifteen minutes. One began boasting about his 48K ZX Spectrum whilst I worried about the prospect of having to wear a nappy instead of knickers beneath my uniform. The other showed off his calculator watch with twenty different alarm tones whilst I imagined a class of twenty kids all pointing and laughing at me. He went onto brag about how awesome his model Audi Quattro rally car will look when he's finished building it. I'm thinking of my Fairy Town train set and Florence, that hateful doll. I have to dress her in the morning and undress her before bed. She sits on my lap whilst I watch TV and lays beside me whilst I sleep. When asked about my Christmas gifts, I listed jeans, socks, gloves, pyjamas, a jumper and 'stuff' for my electric train set. I know I’m not supposed to tell fibs but Mum said it's OK to tell a little 'white' lie when people ask what Santa brought me this year, providing I don't go too far and tell people that I got something expensive like a Commodore 64, a BMX or an Intercity 125 train set. “Surely you got something cool?” they asked, suggesting a book, a game or a music cassette. I shook my head. “Boring!” they exclaimed. Thankfully only four people know the truth; my mum, Kathy, Mrs Webb and me, but even Kathy doesn't know the half of it. 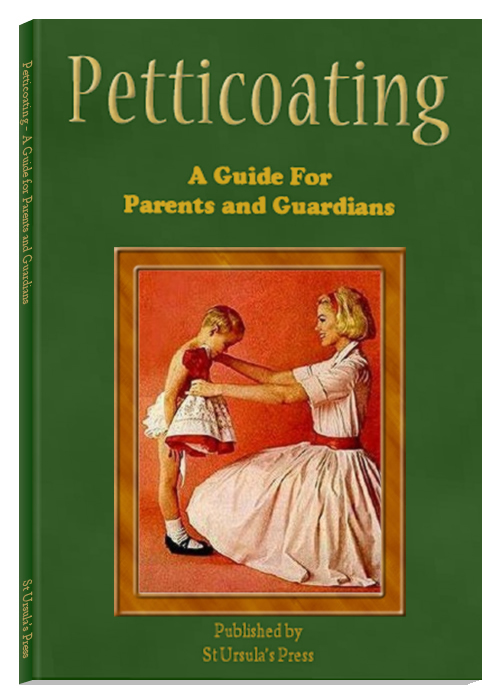 She thinks I only got a doll, a dress and a girl's train set when really... all I got for Christmas was petticoated. A great story P J .Well done on the view count. Great story, many thanks!.....Now, when are you publishing the Pettiquette and Petticoating Guides? It has to be done! glad you liked it... I'd love to write the complete guides referred to in this tale... but I don't think my imagination can stretch that far. 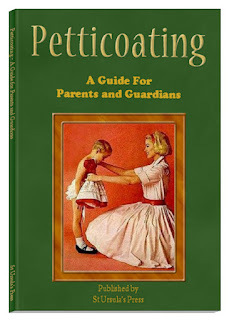 I think the guide for Parents & Guardians appears in another story... but can't recall which one.